The Nonsuch Gallery invites you to step back in time to 17th century Deptford, England, to a wharf lined with businesses and where a ship, the small ketch Nonsuch, has recently docked after a 16 month voyage to what we now call Canada. The original Nonsuch sailed from England in 1668, to trade for furs in Hudson Bay. Her trip proved successful and investors established the Hudson’s Bay Company in 1670. 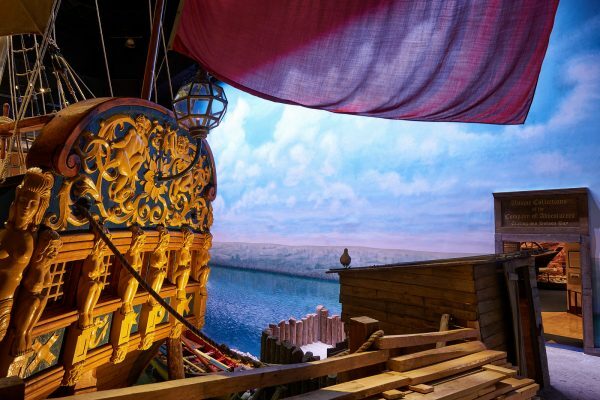 HBC became a powerful force in Canada’s history, making Nonsuch the little ship that started it all! The Nonsuch replica, seen in the Gallery, was built in England in 1968 to celebrate the 300th anniversary of the Hudson’s Bay Company. 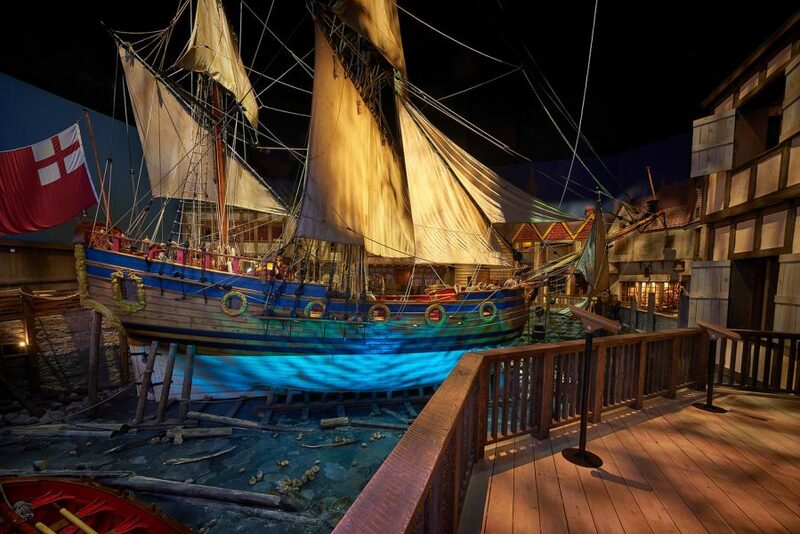 Built using hand tools of the 17th century it is considered one of the finest replicas in the world, and sailed 14,000 kilometres of salt and fresh water before finding her home at the Manitoba Museum in 1974. In 2018, as part of the Bringing Our Stories Forward Gallery Renewal Project, the Nonsuch Gallery has been updated and enhanced. Just before you enter the Gallery, visitors are invited to step into a small alcove to listen to an oral history by Elder Louis Bird as he recounts a story of first contact between European explorers and the Cree of Hudson Bay. Proceeding down a corridor, visitors are taken back in time to a scene set at a wharf in Deptford, England in 1669. The Nonsuch is moored at the dock, an enormous mural of the marshy Isle of Dogs is seen across from the ship, and provides a stunning backdrop for a light and soundscape cycle that simulates day and night, sunshine and rain. The Nonsuch has her many sails unfurled, drying in the breeze after the rain, showing off each inch of hand woven linen. The Nonsuch has just returned from Hudson’s Bay, her cargo is unloaded and stacked on the dock. Visitors make their way past the bales of fur and goods to step aboard the Nonsuch to explore her decks. Take hold of the tiller, reference the compass, and imagine steering her to clear waters! Go below deck to the captain’s cabin and marvel at the narrow confines of her living quarters. Step back ashore and enter the Boar’s Head tavern where Captain Gillam and other members of the crew regale pub visitors with tales of adventure, having wintered at the mouth of the Rupert River and traded with the Cree (modern-day Waskagnaish, Quebec). 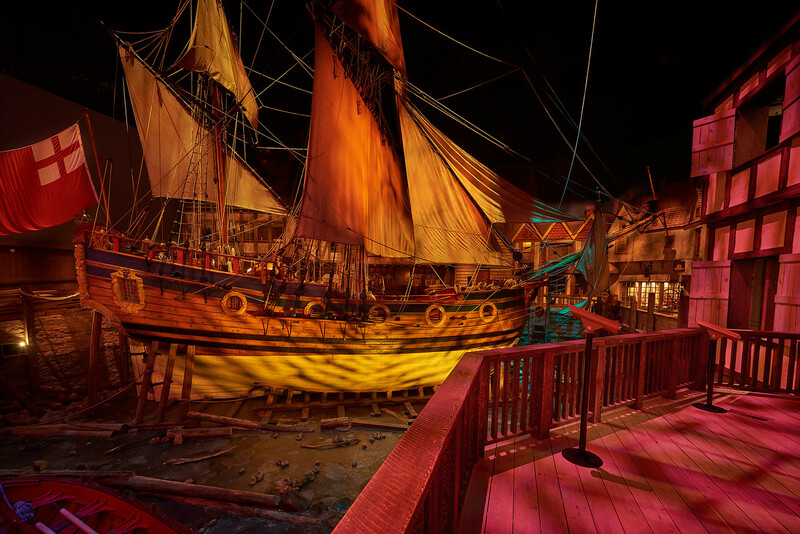 Make your way to the Pier, complete with viewscopes, you’ll have a perfect view of the ship to properly appreciate the beauty of the ship’s construction and visually interrogate the rigging, unfurled sails, and many carved wooden decorations. In addition to the inspiring story of the original 17th century Nonsuch, the replica ship, created in 1968 has its own marvellous story of adventure. 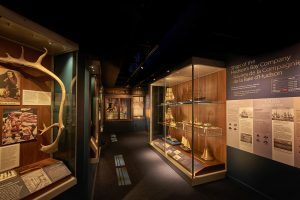 Learn of the creation of the ship using 17th century hand tools, and her voyages through the Atlantic, Great Lakes, Pacific, and eventual journey to her new home at the Manitoba Museum. The adjacent HBC Gallery [link] next door is the entry point to an elevator that takes visitors up to the Nautical Balcony. Here visitors will enjoy a fascinating look into HBC’s past – from a model ship display and highlights of the HBC’s nautical history to stories of fascinating contributions to science and surprising stories about the scope and reach of the HBC beyond fur-trading. This is also a prime location for photographs of the Nonsuch. About the Nonsuch – The Nonsuch replica was built in England to celebrate the 300th anniversary of the Hudson’s Bay Company in 1970. 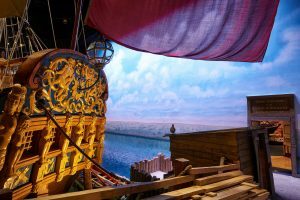 It is considered one of the finest replicas in the world, and sailed 14,000 kilometres of salt and fresh water before finding her home at the Manitoba Museum in 1974. For those who might think the ship might ever leave the Museum, it’s important to note that the gallery walls were built around the Nonsuch and she cannot be removed from the Museum! The reopening of the Nonsuch Gallery coincides with the 350th anniversary of the voyage of the Nonsuch to Hudson Bay in 1668. A summary of the Nonsuch story, by Laird Rankin, author of The Return Nonsuch: The Ship that Launched an Empire. 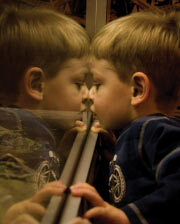 This publication is available at the Museum Shop.